St Hilda’s 130th Anniversay Football Tournament! Are you a young person aged 10 to 12 living in the local area? Join us on Tuesday, 16th April 2019 for a day of fun where you can join a football team! Thanks & looking forward to seeing you there! 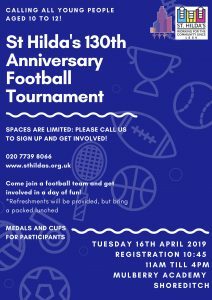 St Hilda's 130th Anniversay Football Tournament!